Another intriguing card from Downfall. Clearly meant to be a fairer replacement for Maxwell James, though time will tell whether it actually is. Seems like a good fit for Geist or maybe tag-me Liza. An obvious combo is with The Turning Wheel in which runners can repeatedly bounce off ETR ice to build up counters on both until they have enough to derez something nasty/expensive then go for a deep dive. Though I reckon this can be countered fairly easily with careful ICE placement. The annoying tag that comes with it can be handily dealt with by another Downfall card: Flip Switch. 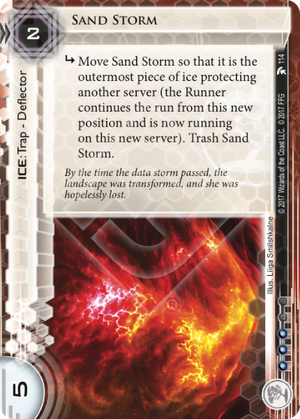 Using this out of Geist with a few Tech Traders installed, you can derez an ice while gaining 2 draws and potentially 6 mid run, which isn’t too shabby at all. I’m sure someone will find a way to abuse this into NPE hell before long, but until then, I think it’s a solid addition to Geist’s arsenal. Infinite drip econ has always been rare in Netrunner, and for good reason, as it is a very powerful engine. Data Folding is one of the last of these cards, now that the very popular mr Phones was rotated by Nisei. But soon, we are getting Rezeki, and I am very excited for it. Unlike the two aforementioned cards, Rezeki has no condition attached to it. You install it, and every turn from now on you will get a credit. However, as this is a program, you have MU to consider. Can you afford to have several of these installed, as well as your ice breakers? In that sense this card has anti-synergy with Data Folding, as the stipulation of having 2 spare MU gets considerably harder with several copies of Rezeki installed. That being said, there are plenty of ways around this problem. Sunny doesn't care about the MU at all, since her cloud breakers don't use any. Install Security Nexus and you can happily have 3 Data Folding and 3 Rezeki dripping. Adam with Brain Chip can also profit from this set up. Good thing Rezeki is only 1 influence! But shapers themselves also have plenty of answers!. Dump them on a Leprechaun, install a couple of Cyberdelia, a 2-MU console... The credits must flow! All in all, I think this is an extremely good card that will see a ton of play, both in and out of faction. Also, I must admit I have never been a huge fan of abstract designs. But big shout-out to Jakuza, for this beautiful card art. Sand Storm, in combination with ice relocation like Mandatory Seed Replacement and Tenma Line, can effectively act as nisei marker for ending the run. This combo would be able to tax the runner massive amounts of credits on an expensive remote, opening a scoring window. Mini Modded and a Magnum Opus click on demand! This card is quitessential shaper goodness! The upfront cost is not insignificant, but seeing as how you can use both effects of The Artist during the same turn, it will pay itself back in no time. With its enormous versatility I expect to see this in a ton of shaper builds, but with 5 influence it probably won't see play elsewhere. Also, can we just appreciate that artwork for a second? Absolutely stunning! Welcome back, Kate. • It’s free of bad publicity and cheaper to rez but a trash cost that is 4 lower than IAF. • It has a “may” clause allowing you to choose and pick when you want to trigger it. What’s the one thing holding CSR back? That measly trash cost of 2. If you’re playing this, you need to find a way to keep it around long enough for it to make a difference – either using your ID ability (IG / CtM), some support cards (Hostile Infrastructure), or by placing it in your scoring remote. Clickless draw can be very beneficial for Corps that can take full advantage of it and downright frightening for those who cannot. If you plan to play this, make the most of it using high-powered operations, Jinja City Grid, or other draw filters.